Image caption Pope Francis says the streets have been transformed "into Formula One tracks"
Drivers who are caught speeding could now cite the Pope when asking for sympathy from the police. At a meeting with traffic police in Italy, Pope Francis urged them to show "mercy" towards those who break the rules of the road. "Mercy is not a sign of weakness", he said. "Nor does it require giving up the use of force." He added that police should seek to understand the reasons why a person has committed an offence. 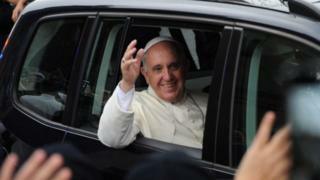 But the Argentine pontiff also spoke of an "increasingly complex and tumultuous" situation on the roads. He said a lifestyle of "haste and a competitiveness" has led to people viewing other drivers "as obstacles or adversaries to be overtaken, transforming the streets into Formula One tracks". The Pope, who has been head of the Roman Catholic Church since 2013, also criticised people who use their mobile phones while driving. "We must take into account the limited sense of responsibility of many drivers, who often do not seem to realise the serious consequences of their distraction," he said. Last week, the Pope blessed a sports car, a gift he received which is being auctioned for charity.